Established in 2006, Betway was one of the first traditional sports betting sites to recognise how fast esports was growing and knew that it had to embrace it. You will read how below. They were one of the first betting providers to sponsor a professional esports team: Ninjas in Pyjamas. Most betting sites have a few verticals (service lines) or categories as follows: Sports, Casino, Live Casino, Poker and Games. Betway knows that in their opinion, Esports deserves its own vertical and it is one of the few traditional betting sites to structure their service in this fashion. 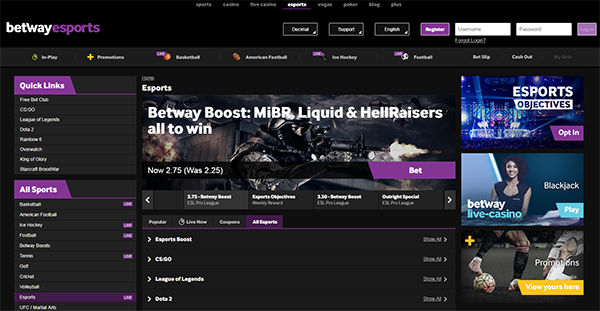 As such, you will notice that Esports can be accessed in the navigation of Betway verticals at the absolute top of your screen. If you find yourself on the normal Betway sports screen, you will also find ‘Esports’ in the left sport index, but clicking on it will bring you to the screen pictured at right, which is the Esports homepage. The Betway site works exactly how you think it should across all resolutions, from mobile up to desktop. It is very quick to load and is highly responsive. There is seemingly no difference in these respects between the desktop, tablet and mobile device resolutions. The bet slip is also super clear and simple to use. Really just and excellent overall design and experience. From the esports homepage, you’ll find the most popular events listed as the default. You can alter your view of events to find those that are happening live, or all events. At left, you’ll find very convenient ‘Quick Links’ which list some of the most popular esports games for quick navigation. In the middle graphical portion of the home screen, you will also notice their ‘Betway Boost’. This advertises combination bets with odds that are boosted from their typical single bet odds prices. If you click or tap on the ‘Bet’ button within the graphic, the site will automatically add this combination bet at the boosted listed odds price to your bet slip at right. You won’t actually place a bet on it unless you add in your stake amount and confirm the bet. Betway tends to offer a simple selection of esports betting markets. Generally, they will simply offer match winner betting markets. You may find some outright winner markets where one could place a bet on the eventual champion if the event is seen to merit a high level of popularity. If there is a major esports competition that is being played, you can be sure that Betway is covering it. Games include but are not limited to: CS:GO, League of Legends, Dota 2, HOTS, Call of Duty, Rainbow Six (R6), Overwatch, King of Glory, Hearthstone, StarCraft (SC 2), FIFA. Available banking methods always depend on your location. So for example, PayPal is accepted by Betway, but it is only available for customers in a select number of mainly European nations. Depending on your nation of residence, Betway accepts credit and debit cards, paysafecard, Skrill, Neteller, EcoPayz, PayPal among others. Betway also offers many difference account currencies including: Euros, US Dollars, British Pounds, Canadian Dollars, New Zealand Dollars, Swedish Kronor, Norwegian Kroner, Swiss Francs, Indian Rupees, Brazilian Reais. You’ll be able to select your currency of choice when you register your account. The bottom line: should you sign up with Betway for esports? If you are looking for a site with an excellent esports-focused interface, regular esports-specific promotions and you only intend to bet on match winners and outright winner markets across a wide variety of esports leagues, Betway is a fantastic choice that matches your needs. The only place where Betway might fall short is if you really want the highest available odds, and/or a wider variety of esports betting markets like Totals, Handicaps and various Map betting markets, but honestly, most people are happy to keep it simple, which is why Betway is best for some. Sometimes simple is best. If you prefer higher odds, higher limits and more betting markets, have a look at Pinnacle.